A handful of spacecraft have used ion engines to reach their destinations, but none have been as powerful as the engines on the BepiColombo spacecraft. BepiColombo is a joint mission between the European Space Agency (ESA) and the Japan Aerospace Exploration Agency (JAXA.) It was launched on October 20, 2018, and has gone through weeks of in-flight commissioning. On Sunday it turned on its powerful ion thrusters for the first time. “We put our trust in the thrusters and they have not let us down.” – Günther Hasinger, ESA Director of Science. BepiColombo is a three-part spacecraft. It has two orbiters, the Mercury Planet Orbiter (MPO) built by the ESA, and the Mercury Magnetospheric Orbiter (MMO) built by JAXA. The third part is the Mercury Transfer Module (MTM), built by ESA. The MTM is the propulsion part of the spacecraft and contains the spacecraft’s four ion engines. Hello all. I hope our readers don’t mind that I’m taking a bit of a diversion here today to engage in a little shameless self-promotion. Basically, I wanted to talk about my recently-published novel – The Jovian Manifesto. This book is the sequel to The Cronian Incident, which was published last year (and was a little shamelessly promoted at the time). However, I also wanted to take this opportunity to talk about hard science fiction and how writing for a science publication helped me grow as a writer. By definition, hard sci-fi refers to stories where scientific accuracy is emphasized. This essentially means that the technology in the story conforms to established science and/or what is believed to be feasible in the future. The planet Mercury, the closet planet to our Sun, is something of an exercise in extremes. Its days last longer than its years and at any given time, its sun-facing side is scorching hot while its dark side is freezing cold. It is also one of the least understood planets in our Solar System. While it is a terrestrial (i.e. rocky) planet like Earth, Venus and Mars, it has a significantly higher iron-to-rock ratio than the others. In the course of searching for planets beyond our Solar System – aka. extra-solar planets – some truly interesting cases have been discovered. In addition to planets that are several times the size of the Solar System’s largest planet (Super-Jupiters), astronomers have also found a plethora of terrestrial (i.e rocky) planets that are several times the size of Earth (Super-Earths). This is certainly true of K2-229b, a rocky planet that was recently discovered by an international team of astronomers. Located 339 light years away, this hot, metallic planet is an exercise in extremes. Not only is it 20% larger than Earth, it is 2.6 times Earth mass and has a composition similar to Mercury. On top of that, its orbits its star so closely that it is several times hotter than Mercury. The study which details their discovery recently appeared in the journal Nature under the title “An Earth-sized exoplanet with a Mercury-like composition“. The study was led by Alexandre Santerne, a researcher from the Laboratoire d’Astrophysique de Marseille (LAM) at the Aix-Marseille Université, and included members from the the European Southern Observatory (ESO), the University of Warwick, the Universidade do Porto, and multiple universities and research institutions. Using data from the Kepler space telescopes K2 mission, the team was able to identify K2-229b, a Super-Earth that orbits a medium-sized K dwarf (orange dwarf) star in the Virgo Constellation. Using the Radial Velocity Method – aka. Doppler Spectroscopy – the team was able to determine the planet’s size and mass, which indicated that it is similar in composition to Mercury – i.e. metallic and rocky. They were also able to determine that it orbits its star at a distance of 0.012 AU with an orbital period of just 14 days. At this distance, K2-229b is roughly one one-hundredth as far from its star as the Earth is from the Sun and experiences surface temperature that are several times higher than those on Mercury – reaching a day side temperature 2000 °C (3632 °F), or hot enough to melt iron and silicon. Given its dense, metallic nature, it is something of a mystery of how this planet formed. One theory is that the planet’s atmosphere could have been eroded by intense stellar wind and flares, given that the planet is so close to its star. Another possibility is that it was formed from a huge impact between two giant bodies billions of years ago – similar to the theory of how the Moon formed after Earth collided with a Mars-sized body (named Theia). As with many recent discoveries, this latest exoplanet is giving astronomers the opportunity to see just what is possible. By studying how them, we are able to learn more about how the Solar System formed and evolved. Given the similarities between K2-229b and Mercury, the study of this exoplanet could teach us much about how Mercury became a dense, metallic planet that orbits closely to our Sun. Back in 2012, scientists were delighted to discover that within the polar regions of Mercury, vast amounts of water ice were detected. While the existence of water ice in this permanently-shaded region had been the subject of speculation for about 20 years, it was only after the Mercury Surface, Space Environment, Geochemistry, and Ranging (MESSENGER) spacecraft studied the polar region that this was confirmed. Based on the MESSENGER data, it was estimated that Mercury could have between 100 billion to 1 trillion tons of water ice at both poles, and that the ice could be up to 20 meters (65.5 ft) deep in places. However, a new study by a team of researchers from Brown University indicates that there could be three additional large craters and many more smaller ones in the northern polar region that also contain ice. The study, titled “New Evidence for Surface Water Ice in Small-Scale Cold Traps and in Three Large Craters at the North Polar Region of Mercury from the Mercury Laser Altimeter“, was recently published in the Geophysical Research Letters. Led by Ariel Deutsch, a NASA ASTAR Fellow and a PhD candidate at Brown University, the team considered how small-scale deposits could dramatically increase the overall amount of ice on Mercury. Despite being the closest planet to the Sun, and experiencing scorching surface temperatures on its Sun-facing side, Mercury’s low axial tilt means that its polar regions are permanently shaded and experience average temperatures of about 200 K (-73 °C; -100 °F). The idea that ice might exist in these regions dates back to the 1990s, when Earth-based radar telescopes detected highly reflective spots within the polar craters. For the sake of this new study, Deutsch was joined by Gregory A. Neumann, a research scientist from NASA’s Goddard Space Flight Center, and James W. Head. In addition to being a professor the Department of Earth, Environmental and Planetary Sciences at Brown, Head was also a co-investigator for the MESSENGER and the Lunar Reconnaissance Orbiter missions. Together, they examined data from MESSENGER’s Mercury Laser Altimeter (MLA) instrument. This instrument was used by MESSENGER to measure the distance between the spacecraft and Mercury, the resulting data being then used to create detailed topographical maps of the planet’s surface. But in this case, the MLA was used to measure surface reflectance, which indicated the presence of ice. As an instrument specialist with the MESSENGER mission, Neumann was responsible for calibrating the altimeter’s reflectance signal. These signals can vary based on whether the measurements are taken from overhead or at an angle (the latter of which is refereed to as “off-nadir” readings). Thanks to Neumann’s adjustments, researchers were able to detect high-reflectance deposits in three more large craters that were consistent with water ice. According to their estimates, these three craters could contain ice sheets that measure about 3,400 square kilometers (1313 mi²). In addition, the team also looked at the terrain surrounding these three large craters. While these areas were not as reflective as the ice sheets inside the craters, they were brighter than the Mercury’s average surface reflectance. Beyond this, they also looked at altimeter data to seek out evidence of smaller scale deposits. What they found was four smaller craters, each with diameters of less than 5 km (3 mi), which were also more reflective than the surface. From this, they deduced that there were not only more large deposits of ice that were previously undiscovered, but likely many smaller “cold traps” where ice could exist as well. In the past, studies of the lunar surface also confirmed the presence of water ice in its cratered polar regions. Further research indicated that outside of the larger craters, small “cold traps”could also contain ice. According to some models, accounting for these smaller deposits could effectively double estimates on the total amounts of ice on the Moon. Much the same could be true for Mercury. In addition to indicating the Solar System may be more watery than previously suspected, the presence of abundant ice on Mercury and the Moon has bolstered proposals for building outposts on these bodies. These outposts could be capable of turning local deposits water ice into hydrazine fuel, which would drastically reduce the costs of mounting long-range missions throughout the Solar System. On the less-speculative side of things, this study also offers new insights into how the Solar System formed and evolved. If water is far more plentiful today than we knew, it would indicate that more was present during the early epochs of planetary formation, presumably when it was being distributed throughout the Solar System by asteroids and comets. What is the Weather Like on Mercury? With the dawning of the Space Age in the 1950s, human beings were no longer confined to studying the Solar planets and other astronomical bodies with Earth-based instruments alone. Instead crewed missions have gone into orbit and to the Moon while robotic missions have traveled to every corner of the Solar System. And in the process, we have learned some interesting things about the planets, planetoids, and asteroids in our Solar neighborhood. For example, we have learned that all the Solar planets have their own particular patterns and cycles. For instance, even though Mercury is an airless body, it does have a tenuous exosphere and experiences seasons of a sort. And while it is known for being extremely hot, it also experiences extremes of cold, to the point that ice can exist on its surface. While it is by no means what we are used to here on Earth, Mercury still experiences a kind of “weather”. As noted, Mercury has no atmosphere to speak of, owing to its small size and extremes in temperature. However, it does have a tenuous and variable exosphere that is made up of hydrogen, helium, oxygen, sodium, calcium, potassium and water vapor, with a combined pressure level of about 10-14 bar (one-quadrillionth of Earth’s atmospheric pressure). It is believed this exosphere was formed from particles captured from the Sun (i.e solar wind) as well as volcanic outgassing and debris kicked into orbit by micrometeorite impacts. In any case, Mercury’s lack of a viable atmosphere is the reason why it is unable to retain heat from the Sun, which leads to extreme variations between night and day for the rocky planet. Mercury’s temperature variations are also attributed to its orbital eccentricity of 0.2056, which is the most extreme of any planet in the Solar System. Essentially, its distance from the Sun ranges from 46 million km (29 million mi) at its closest (perihelion) to 70 million km (43 million mi) at its farthest (aphelion). As a result, the side facing the Sun reaches temperatures of up to 700 K (427° C), the side in shadow dips down to 100 K (-173° C). With an average rotational speed of 10.892 km/h (6.768 mph), Mercury also takes 58.646 days to complete a single rotation. This means that Mercury has a spin-orbit resonance of 3:2, where it completes three rotations on its axis for every two rotations completed around the Sun. This does not, however, mean that three days last the same as two years on Mercury. In fact, its high eccentricity and slow rotation mean that it takes 176 Earth days for the Sun to return to the same place in the sky (aka. a solar day). In short, a single day on Mercury is twice as long as a single year! Mercury also has the lowest axial tilt of any planet in the Solar System – approximately 0.027 degrees compared to Jupiter’s 3.1 degrees (the second smallest). This low tilt means that the polar regions are constantly in shadow, which leads to another interesting feature about Mercury. Yes, despite how hot its Sun-facing side can become, the existence of water ice and even organic molecules have been confirmed on Mercury’s surface. But this only true at the poles, where the floors of deep craters are never exposed to direct sunlight, and temperatures within them therefore remain below the planetary average. These icy regions are believed to contain about 1014–1015 kg (1 to 10 billion metric tons, 1.1 to 11 billion US tons) of frozen water, and may be covered by a layer of regolith that inhibits sublimation. The origin of the ice on Mercury is not yet known, but the two most likely sources are from outgassing of water from the planet’s interior or deposition by the impacts of comets. When one talks about the “weather” on Mercury, they are generally confined to talking about variations between the Sun-facing side and the night side. Over the course of two years, that weather will remain scorching hot or freezing cold. In that respect, we could say that a single season on Mercury lasts a full four years, and includes a “Midnight Sun” that lasts two years, and a “Polar Night” that lasts the same. We have written many interesting articles about the weather on other planets here at Universe Today. Here’s What is the Weather like on Venus?, What is the Weather Like on Mars?, What is the Weather Like on Jupiter?, What is the Weather Like on Saturn?, What is the Weather Like on Uranus?, and What is the Weather Like on Neptune? If you’d like more information on Mercury, check out NASA’s Solar System Exploration Guide, and here’s a link to NASA’s MESSENGER Misson Page. 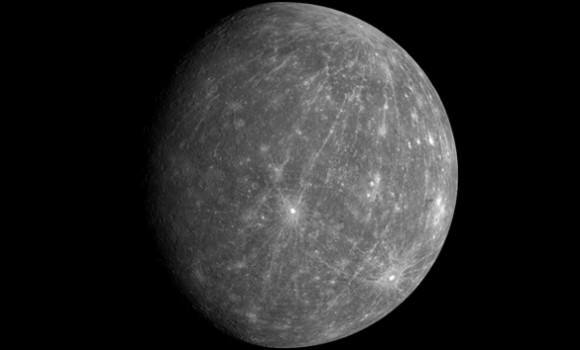 We’ve also recorded an entire episode of Astronomy Cast all about Mercury. Listen here, Episode 49: Mercury. How Does Mercury Compare to Earth? Mercury was appropriately named after the Roman messenger of the Gods. This is owed to the fact that its apparent motion in the night sky was faster than that of any of the other planets. As astronomers learned more about this “messenger planet”, they came to understand that its motion was due to its close orbit to the Sun, which causes it to complete a single orbit every 88 days. Mercury’s proximity to the Sun is merely one of its defining characteristics. Compared to the other planets of the Solar System, it experiences severe temperature variations, going from very hot to very cold. It’s also very rocky, and has no atmosphere to speak of. But to truly get a sense of how Mercury stacks up compared to the other planets of the Solar System, we need to a look at how Mercury compares to Earth. The diameter of Mercury is 4,879 km, which is approximately 38% the diameter of Earth. In other words, if you put three Mercurys side by side, they would be a little larger than the Earth from end to end. While this makes Mercury smaller than the largest natural satellites in our system – such as Ganymede and Titan – it is more massive and far more dense than they are. In fact, Mercury’s mass is approximately 3.3 x 1023 kg (5.5% the mass of Earth) which means that its density – at 5.427 g/cm3 – is the second highest of any planet in the Solar System, only slightly less than Earth’s (5.515 g/cm3). This also means that Mercury’s surface gravity is 3.7 m/s2, which is the equivalent of 38% of Earth’s gravity (0.38 g). This means that if you weighed 100 kg (220 lbs) on Earth, you would weigh 38 kg (84 lbs) on Mercury. Meanwhile, the surface area of Mercury is 75 million square kilometers, which is approximately 10% the surface area of Earth. If you could unwrap Mercury, it would be almost twice the area of Asia (44 million square km). And the volume of Mercury is 6.1 x 1010 km3, which works out to 5.4% the volume of Earth. In other words, you could fit Mercury inside Earth 18 times over and still have a bit of room to spare. In terms of orbit, Mercury and Earth probably could not be more different. For one, Mercury has the most eccentric orbit of any planet in the Solar System (0.205), compared to Earth’s 0.0167. Because of this, its distance from the Sun varies between 46 million km (29 million mi) at its closest (perihelion) to 70 million km (43 million mi) at its farthest (aphelion). This puts Mercury much closer to the Sun than Earth, which orbits at an average distance of 149,598,023 km (92,955,902 mi), or 1 AU. This distance ranges from 147,095,000 km (91,401,000 mi) to 152,100,000 km (94,500,000 mi) – 0.98 to 1.017 AU. And with an average orbital velocity of 47.362 km/s (29.429 mi/s), it takes Mercury a total 87.969 Earth days to complete a single orbit – compared to Earth’s 365.25 days. However, since Mercury also takes 58.646 days to complete a single rotation, it takes 176 Earth days for the Sun to return to the same place in the sky (aka. a solar day). So on Mercury, a single day is twice as long as a single year. Meanwhile on Earth, a single solar day is 24 hours long, owing to its rapid rotation of 1674.4 km/h. Mercury also has the lowest axial tilt of any planet in the Solar System – approximately 0.027°, compared to Earth’s 23.439°. Much like Earth, Mercury is a terrestrial planet, which means it is composed of silicate minerals and metals that are differentiated between a solid metal core and a silicate crust and mantle. For Mercury, the breakdown of these elements is higher than Earth. Whereas Earth is primarily composed of silicate minerals, Mercury is composed of 70% metallic and 30% of silicate materials. Also like Earth, Mercury’s interior is believed to be composed of a molten iron that is surrounded by a mantle of silicate material. Mercury’s core, mantle and crust measure 1,800 km, 600 km, and 100-300 km thick, respectively; while Earth’s core, mantle and crust measure 3478 km, 2800 km, and up to 100 km thick, respectively. What’s more, geologists estimate that Mercury’s core occupies about 42% of its volume (compared to Earth’s 17%) and the core has a higher iron content than that of any other major planet in the Solar System. Several theories have been proposed to explain this, the most widely accepted being that Mercury was once a larger planet that was struck by a planetesimal that stripped away much of the original crust and mantle. 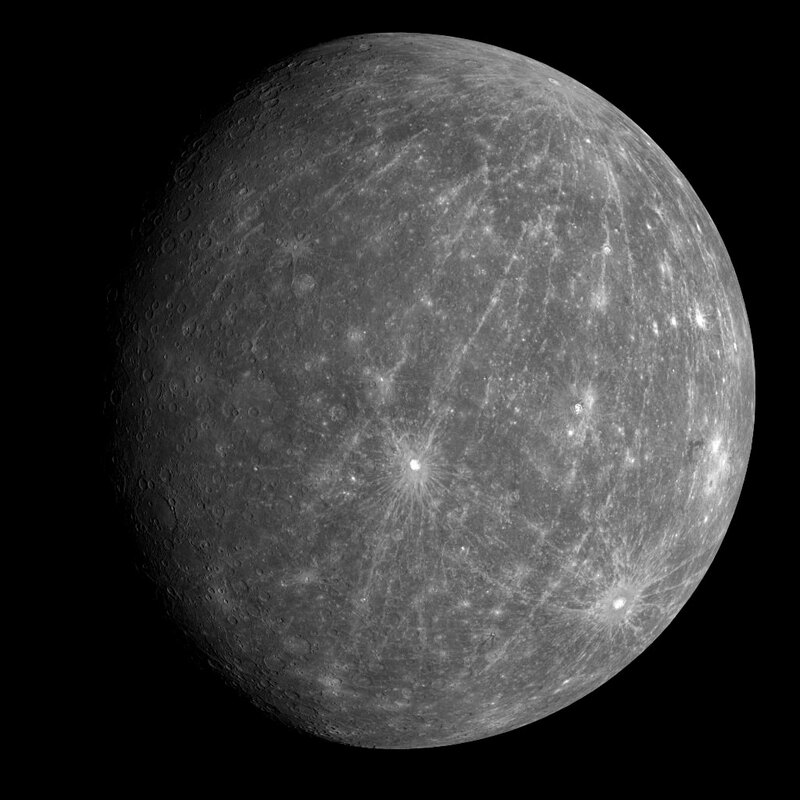 In terms of its surface, Mercury is much more like the Moon than Earth. It has a dry landscape pockmarked by asteroid impact craters and ancient lava flows. Combined with extensive plains, these indicate that the planet has been geologically inactive for billions of years. Names for these features come from a variety of sources. Craters are named for artists, musicians, painters, and authors; ridges are named for scientists; depressions are named after works of architecture; mountains are named for the word “hot” in different languages; planes are named for Mercury in various languages; escarpments are named for ships of scientific expeditions, and valleys are named after radio telescope facilities. During and following its formation 4.6 billion years ago, Mercury was heavily bombarded by comets and asteroids, and perhaps again during the Late Heavy Bombardment period. Due to its lack of an atmosphere and precipitation, these craters remain intact billions of years later. Craters on Mercury range in diameter from small bowl-shaped cavities to multi-ringed impact basins hundreds of kilometers across. The largest known crater is Caloris Basin, which measures 1,550 km (963 mi) in diameter. The impact that created it was so powerful that it caused lava eruptions on the other side of the planet and left a concentric ring over 2 km (1.24 mi) tall surrounding the impact crater. Overall, about 15 impact basins have been identified on those parts of Mercury that have been surveyed. Earth’s surface, meanwhile, is significantly different. For starters, 70% of the surface is covered in oceans while the areas where the Earth’s crust rises above sea level forms the continents. Both above and below sea level, there are mountainous features, volcanoes, scarps (trenches), canyons, plateaus, and abyssal plains. The remaining portions of the surface are covered by mountains, deserts, plains, plateaus, and other landforms. Mercury’s surface shows many signs of being geologically active in the past, mainly in the form of narrow ridges that extend up to hundreds of kilometers in length. It is believed that these were formed as Mercury’s core and mantle cooled and contracted at a time when the crust had already solidified. However, geological activity ceased billions of years ago and its crust has been solid ever since. Meanwhile, Earth is still geologically active, owning to convection of the mantle. The lithosphere (the crust and upper layer of the mantle) is broken into pieces called tectonic plates. These plates move in relation to one another and interactions between them is what causes earthquakes, volcanic activity (such as the “Pacific Ring of Fire“), mountain-building, and oceanic trench formation. When it comes to their atmospheres, Earth and Mercury could not be more different. Earth has a dense atmosphere composed of five main layers – the Troposphere, the Stratosphere, the Mesosphere, the Thermosphere, and the Exosphere. Earth’s atmosphere is also primarily composed of nitrogen (78%) and oxygen (21%) with trace concentrations of water vapor, carbon dioxide, and other gaseous molecules. Because of this, the average surface temperature on Earth is approximately 14°C, with plenty of variation due to geographical region, elevation, and time of year. The hottest temperature ever recorded on Earth was 70.7°C (159°F) in the Lut Desert of Iran, while the coldest temperature was -89.2°C (-129°F) at the Soviet Vostok Station on the Antarctic Plateau. Mercury, meanwhile, has a tenuous and variable exosphere that is made up of hydrogen, helium, oxygen, sodium, calcium, potassium and water vapor, with a combined pressure level of about 10-14 bar (one-quadrillionth of Earth’s atmospheric pressure). It is believed this exosphere was formed from particles captured from the Sun, volcanic outgassing and debris kicked into orbit by micrometeorite impacts. Because it lacks a viable atmosphere, Mercury has no way to retain the heat from the Sun. As a result of this and its high eccentricity, the planet experiences far more extreme variations in temperature than Earth does. Whereas the side that faces the Sun can reach temperatures of up to 700 K (427° C), the side that is in darkness can reach temperatures as low as 100 K (-173° C). Despite these highs in temperature, the existence of water ice and even organic molecules has been confirmed on Mercury’s surface. The floors of deep craters at the poles are never exposed to direct sunlight, and temperatures there remain below the planetary average. In this respect, Mercury and Earth have something else in common, which is the presence of water ice in its polar regions. Much like Earth, Mercury has a significant, and apparently global, magnetic field, one which is about 1.1% the strength of Earth’s. It is likely that this magnetic field is generated by a dynamo effect, in a manner similar to the magnetic field of Earth. This dynamo effect would result from the circulation of the planet’s iron-rich liquid core. Mercury’s magnetic field is strong enough to deflect the solar wind around the planet, thus creating a magnetosphere. The planet’s magnetosphere, though small enough to fit within Earth, is strong enough to trap solar wind plasma, which contributes to the space weathering of the planet’s surface. All told, Mercury and Earth are in stark contrast. While both are terrestrial in nature, Mercury is significantly smaller and less massive than Earth, though it has a similar density. Mercury’s composition is also much more metallic than that of Earth, and its 3:2 orbital resonance results in a single day being twice as long as a year. But perhaps most stark of all are the extremes in temperature variations that Mercury goes through compared to Earth. Naturally, this is due to the fact that Mercury orbits much closer to the Sun than the Earth does and has no atmosphere to speak of. And its long days and long nights also mean that one side is constantly being baked by the Sun, or in freezing darkness. We have also recorded a whole episode of Astronomy Cast that’s just about planet Mercury. Listen to it here, Episode 49: Mercury. In terms of volume, Mercury once again becomes a bit diminutive, at least by Earth standards. Basically, Mercury has a volume of 6.083×1010 km³ (60 billion cubic km; 14.39 trillion cubic miles) which works out to 0.056 times the volume of the Earth. In other words, you could fit Mercury inside Earth almost twenty times over. By popular request, Isaac Arthur and I have teamed up again to bring you a vision of the future of human space exploration. This time, we bring you practical construction tips from a pair of Type 2 Civilization engineers. To make this collaboration even better, we’ve teamed up with two artists, Kevin Gill and Sergio Botero. They’re going to help create some special art, just for this episode, to help show what some of these megaprojects might look like. I’d also like to congratulate Gannon Huiting for suggesting the topic for this collaboration. We both asked our Patreon communities to brainstorm ideas, and his core idea sparked the idea for the episode. You get one of my precious metal meteorites, which I guarantee will give you a mostly worthless superpower. We’ll tell you the story of what it took to go from our first tentative steps into space to the vast Solar System spanning civilization we have today. How did we extract energy and resources from the Moon, planets and even gas giants of the Solar System? How did we shift around and dismantle the worlds to provide the raw resources of our civilization? Humanity’s ability to colonize the Solar System was unleashed when we harvested deposits of helium 3 from the Moon. This isotope of helium is rare on Earth, but the constant solar wind from the Sun has deposited a layer across the Moon, though its regolith. Helium 3 was the best, first energy source we got our hands on, and it changed everything. Although other kinds of fusion reactors can produce more energy with more efficiency, the advantage of helium 3 is that the fusion reaction releases no neutrons. This means you can have a fusion reactor on your starship or on your base with much less shielding. We still use helium-3 reactors when living creatures need to be close the reactor, or the ship can’t afford to carry around heavy shielding. The Helium 3 is found within the first 100 cm of the lunar regolith. Harvesting it started slowly, but in time, our mining machines grew larger, and we stripped this layer completely off the Moon. There are other repositories across the Solar System, in the regolith of Mercury, other moons and asteroids across the Solar System, and in the atmospheres of the giant planets. We later switched to getting our Helium 3 from Uranus and Neptune, but the Moon got everything started. One of our big problems with building in space was getting raw materials. Just about every place that has the supplies we needed was at the bottom very deep gravity wells which made accessing those materials a lot harder. Asteroid and moons offered us a large supply of material that was not locked inside such deep gravity wells. These asteroids also gave us a big initial head start on developing space-based infrastructure as they contained a great deal of precious metals that we could bring home to help fund our endeavors. For all that, the entire Asteroid Belt contains much less material than Earth’s own Moon. The ease of mining and transport on these bodies made them a critical source of raw materials for building up the early Solar Infrastructure and many of them became homes to rotating habitats buried deep inside the asteroid, where millions of people live comfortably shielded from the hazards of space and support themselves mining the asteroid around them. These asteroids and moons often contained water in the form of ice, which is vital to creating life-bearing habitats in space, as well as fuel and propellant for many early-era spaceships. However, even if the entire Asteroid Belt was ice, instead of it being a fairly smaller percent of the mass, that would still only be the approximate mass of Earth’s Oceans. There was a plentiful supply for early efforts but not enough for major terraforming efforts on places like Mars or creating many artificial habitats. Water is incredibly scarce in the inner Solar System, but becomes more plentiful as we make our way further out, past the Solar System’s Frost Line. Deeper out past the planets we find enough water to make whole planets out of, as hydrogen and oxygen are the first and third most abundant elements in the Universe. Also, for the most part these come in convenient iceberg-sized packages, low enough in mass to have a small gravity well and to be movable. Mastering the Solar System required moving very large objects in space. For the less massive objects, we could put a big thruster on it, but for the largest projects, such as moving planets with atmospheres (which we’ll get to later in this article), another technique was required. To move large objects around, without touching them, you need a Gravity Tractor. Want to move an asteroid? Use the gravity of a less massive object, like a spaceship. Hold the spaceship close to the asteroid, and their gravity will put them together. Fire your rocket’s thrusters to keep the distance, and you slowly pull the asteroid in any direction you like. It takes a long time, and does require fuel, but you can use this technique to move anything anywhere in the Solar System. Put a massive satellite into orbit around an asteroid. When the satellite is on one side of the asteroid it fires its thrusters towards the satellite. And then on the other side of its orbit, it fires its thrusters away from the satellite. The satellite will have been pushed twice in the same direction. To an outside observer that satellite has moved, though on the asteroid it will seem to have been nudged closer than put back. Don’t forget that the satellite pulls on the asteroid with just as much force as the asteroid exerts on the satellite. Earth pulls on the Sun just as hard as it pulls on us, but it’s more massive so it doesn’t move as much. But it does move, and so by pushing on the satellite towards the primary then pushing away on the opposite side, we move the primary body. We can also take advantage of momentum transfers from gravity to alter the course of an object by making a close flyby. You can use this gravitational slingshot to use the gravity of a planet to change the move large objects into a new trajectory. Over time, we put gravitational tugs into orbit around every chunk of rock and ice that we wanted to move, shifting their locations to the best places in the Solar System. Some places gave us raw materials. Other places would serve as our homes. Earth is the third closest planet to the Sun and it will always be the environment we’re trying to replicate. Earth is, well, it was… home. For all the millions of other worlds across the Solar System, we made them capable of hosting life with a little work. Often we could make them habitable just by increasing the amount of energy they received from the Sun. Creating artificial gravity by spinning a habitat or breathable air by doming it over did us no good if there wasn’t enough light to melt ice into water or let plants grow. The farther you get from the Sun, the less light you get, but we bounce light that would have been lost, concentrating it to let life flourish. The Sun gives off over a billion times the light that actually reaches Earth, so there’s no shortage in quantity, just concentration. This was the first sunset observed in color by Curiosity on Mars. Credit: NASA/JPL-Caltech/MSSS/Texas A&M Univ. To double the light reaching a planet like Mars, you would need a mirror surface area of twice the size of Mars. But not twice the mass of Mars. For every square meter of land on Earth, there’s about 10 billion kilograms of mass under our feet. A mirror on Earth wouldn’t weigh much more than a kilogram a square meter, but in space we can go far thinner. Any one of millions of small asteroids in the solar system contains enough material to make a planetary surface’s worth of mirrors. Lenses or parabolic reflectors let us move light in from far more densely concentrated locations closer to the Sun. Reflecting light also allows us to remove harmful or less useful invisible wavelengths like ultraviolet or x-rays. This allowed us to make almost any place warm and bright enough. We took distant moons and asteroids far from the Sun, and gave them a collar of thin mirrors bouncing light into a parabolic dish. By bouncing this light into rotating habitats safely buried inside the asteroid, we created warm, lush garden worlds in environments so cold that air itself would condense into a liquid. For most of the Solar System we wanted to warm planets up. But for Venus and Mercury, we needed to cool them down. We did this by placing shades between them and the Sun to reflect away some of the light hitting them. The easiest way to do this was to position an opaque material between the planet and the Sun, at the L1 Lagrange point. At this point the gravitational pull of the planet counteracts the pull of the Sun allowing a large thin solar shade to remain in position with minimal energy. This way the planet is cooled. But we did better than merely cool, we shaped the light to our needs. With a collection of many small shades, we avoided putting a visible dark spot on the Sun. Sunlight comes in many frequencies, from radio to x-rays; some were more valuable to us than others. Plants mostly use red and blue light, while green light doesn’t help with photosynthesis. So blocked a decent amount of green light, some blue, and no red, and cooled the planet without harming plant life and without really altering how the light looked to our eyes. We engineered the perfect material for our shades which was mostly transparent to the wavelengths of light we wanted and mostly reflective or absorptive to the ones we didn’t. Ultraviolet is a good example. We wanted some to get to our planet, as it does help as a sterilizing agent to biological processes and it helps make ozone, but we wanted to cut most of that out. Even better, about half of the light coming from the Sun is in infrared, which we can’t see and which plants don’t use. We blocked most of that and seriously lowered temperatures on Venus and Mercury. We set up shades to block the light from reaching our planets. And we did the same with dangerous radiation streaming from the Sun. We set up a concentrated magnetic shield at the Mars-Sun L1 Lagrange point, which catches and redirects high energy particles. This protects a world from the Sun, but it doesn’t prevent harmful cosmic rays, which can come from any part of the sky. Our own planet Earth has a robust magnetosphere, and it’s the main reason we have air to breath and don’t absorb dangerous radiation from the Sun and space. Places like Mars don’t. For this purpose, we created artificial magnetospheres. We considered trying to get Mars’ core spinning fast and hot so that rapid spinning molten ferromagnetic materials would generate a protective magnetosphere. But that was too much effort. We didn’t actually care what generated the magnetic field, we just wanted the magnetic field. In the end we deployed a constellation of electromagnetic satellites around every world exposed to space. These satellites could do double duty, harvesting solar radiation and generating an artificial magnetosphere. Cosmic rays and radioactive particles from the Sun were captured and redirected safely away from the world, allowing us to roam freely on the surface. Once we had made acquired the resources of every world in the Solar System, we began our next great engineering effort. To move and dismantle the worlds themselves. To create the optimal configuration that gave us the most living space and the most usable energy. We began the construction of our Dyson swarm. Moving planets is almost impossible. But not completely impossible. How do you get all that energy to move a world without melting it? The orbital energy of Earth around the Sun is approximately 30 million, trillion, trillion joules. That’s equal to all the energy the Sun puts out over a few months. Of course, the Sun is slowly warming up, and while estimates vary, it’s generally accepted that in about a billion years it will have warmed up enough that Earth would be uninhabitable. Moving the Earth was inevitable. To move the Earth outward to counteract the increased solar luminosity, we needed to add orbital energy. A lot of energy. Earlier, we discussed using gravity tractors and gravitational slingshots to slowly and steadily move objects around the Solar System. This technique works at the largest scales too. A gravity tractor could slowly and steadily move an entire planet if you had enough time and fuel. Because we already had mastery of all the asteroids in the Solar System, we put them into orbits that swept past worlds. Each gravitational slingshot gave or stole orbital momentum from the world, pushing it closer or farther from the Sun. We also used orbital mirrors to bounce sunlight from the Sun. With enough of them, deflecting their light in the same general directional while maintaining an orbit around the planet, we could move worlds without touching them or heating them up from the light beams. With enough satellites to keep the net gravitational force on the planet homogenous, we didn’t have to worry about tidal heating, allowing us to move a planet far faster. In the future, we’ll use a king-size version of this to move the entire Solar System, using the star as the power source, called a Shkadov Thruster. We will push the Sun and every star we control into a constellation that matches our needs. But that’s a problem our Type III civilization engineers will have to worry about. Like a cosmic lava lamp, a large section of Pluto’s icy surface in Sputnik Planum is being constantly renewed by a process called convection that replaces older surface ices with fresher material. Credit: NASA/Johns Hopkins University Applied Physics Laboratory/Southwest Research Institute. We always needed ice. For water, for fuel and for air. And the outer Solar System had all the ice we could ever need. We brought comets and other icy bodies in from the outer Solar System to bring water to the planets we’re terraforming – Mars, Venus, and the large moons of the Solar System. Pushing ice is a tricky process, but the comet itself is the source of fuel, either liquid hydrogen and oxygen as the propellants or using the hydrogen for a fusion torch drive. However we have an alternative trick we can use. We just talked about using energy beams, focused sunlight, lasers, or microwave beams to push objects outward from the sun. You can also move inward by reflecting the beam off at an angle, removing orbital momentum. This lowers their orbit into the Solar System. By setting up energy collectors on comets, we could beam power out them, and use that energy to melt atoms into gas and accelerate them away with a magnetic field, just like an ion drive. This let us take high-strength lasers and microwave beams powered from the inner Solar System and use it to tractor comets inward. The propellant melted off the comets could carry away far more momentum than the energy beam added, though at the cost of losing some of your mass in the process. One by one we identified the icy bodies in the Kuiper Belt and Oort Cloud, installed an ice engine, and pulled them inward, to the places we needed that water the most. The day to day energy for our civilization comes from the Sun. Solar collectors power the machines, computers and systems that make day-to-day life spanning the Solar System possible. Just as the ancient Earth civilizations used hydrocarbons as a store of fuel, we depend on hydrogen. We use it for our rocket fuel, to manufacture drinking water, and most importantly, for our fusion reactors. We always need more hydrogen. Fortunately, the Solar System has provided us with vast repositories of hydrogen: the giant planets, Jupiter, Saturn, Uranus and Neptune all made up of at least 80% hydrogen. But harvesting the planets for their hydrogen isn’t without its challenges. For starters, the gravity on the surface of Jupiter is nearly 25 m/s2, which is nearly three times the surface gravity of Earth. On top of that, Jupiter’s magnetosphere produces intense radiation fields through its entire system. You can’t spend much time near Jupiter without receiving a lethal radiation dose. We deploy huge robotic scoopers to swoop down into Jupiter’s gravity well, skim across the upper cloud tops, funneling in as much hydrogen as they can. On board compressors liquefy the hydrogen, or refine it into the more energy dense metallic hydrogen. The fuel is then distributed across the Solar System through the interplanetary transport network. For Uranus and Neptune, where the gravity well is less extreme, we have permanent mining stations which float in the cloud tops, harvesting raw materials for return back to space. These factories are a huge improvement over the more expensive scoop ships. Smaller cargo ships ferry the deuterium, helium-3 and hydrogen up to orbit, for an energy hungry Solar System. In order to construct our Dyson Swarm, we will eventually need to dismantle almost all the planets and moons in the Solar System to provide the raw materials to house countless people. This process has begun, and we we have a number of options. For some worlds, we plan to just keep mining and refining them with robotic factories until they are gone, but this can be quite time consuming and often we would rather do our refining and manufacturing elsewhere. Instead, we have set up very large mass drivers running around the object to launch material directly towards its desired destination. To avoid building up angular momentum inside the shrinking mass of the planetoid, we run these giant cannons in both directions. This prevents it spinning so fast that it tears itself apart. There’s very little gravity holding these objects together after all. For the smaller objects that’s actually just fine. When we want to disassemble a smaller asteroid or moon into rock and dirt for the inside of a cylinder habitat, we construct a cylindrical shell around the asteroid, and spray material from the asteroid onto the cylinder, giving it some spin and artificial gravity to hold the material up, or rather down to its surface. We spin the asteroid faster and faster until it flies apart, transferring its material and its angular momentum to the cylinder. With larger asteroids we send a series of cylinders past them in a chain, painting their interiors with the material we will turn into dirt later on, until we run out of asteroid. For full blown minor planets and moons, which are much more massive but still fairly low in gravity and lacking an atmosphere, we pump matter up tubes to high above the planetoid to fill freighters, get compacted into cannon balls to be launched elsewhere, or simply pumped into rotating habitats being built nearby. Mercury is already half consumed. In a few more generations, it will be a distant memory. Perhaps our greatest accomplishment is the work underway at Jupiter and Saturn. We are now in the process of dismantling these worlds to harvest their resources. The largest machines humanity has ever built, fusion candles, have been deployed into the atmospheres of Jupiter and Saturn. These enormous machines scoop up raw hydrogen from Jupiter to run their fusion reactors. One side of the fusion candle fires downward, keeping the machine aloft. The other end blasts out into space, spewing material that can be harvested from orbit. Not only that, but these candles provide thrust, pushing Jupiter and Saturn slowly but steadily into safer, more useful orbits for our civilization. As we use up the hydrogen, their mass will decrease. Uranus and Neptune will follow slowly, from farther out in the Solar System. Eventually, eons into the future, we will have dismantled them down to their cores. There is more than a dozen times the mass of the Earth in rock and metal down at the core of Jupiter. More raw materials than any other place in the Solar System. The long awaited construction of our fully operational Dyson swarm will finally begin. We’ll miss the presence of Jupiter and Saturn in the Solar System, and remember them fondly, but humanity needs room to stretch its legs. Of course, as huge as the gas giants are compared to Earth, the Sun is far bigger, and contains not just hydrogen and helium but thousands of planets worth of heavier elements, which are spread around the sun, not just concentrated deep down. Trying to scoop matter off a star is much harder than out of gas giant, though conveniently, we can take advantage of all that energy the Sun is giving off to power our extraction. The material on the Sun is also ionized, so it reacts strongly to magnetic forces, and the Sun generates a massively powerful magnetic field too. In fact, our Sun ejects about a billion kilograms of matter a second as solar wind. We have a few ways to increase this flow and harvest it. The first is called Thermal Driven Outflow. We hover mirrors over the surface, reflecting and concentrating light down on spots on the Sun’s surface to heat it up and increase the mass being ejected. This kicks up an eruption much like a solar flare, feeding more solar wind. We then place a large ring of satellites around the Sun’s equator, connected to each other by a stream of ionized particles generating a huge current, themselves running that stream off solar power. This ring creates a powerful magnetic field pushing outward toward the Sun’s poles, and sending the super-heated matter in that direction. Hovering over the poles further out, we have a giant ring sucking up sunlight and generating a huge toroidal magnetic field. All the matter we stir up on the sun and off the poles is sucked through that and slowed down for collection. It’s a lot like the VASIMR Drive, using a magnetic nozzle, so that nothing has to touch the ultra hot plasma. Giant Plasma Thrusters essentially acting as the pump to gather the matter, it stays in place using the momentum it’s stealing from the particles it is slowing down, again it’s a giant plasma thruster. We will eventually build far more of these rings around the Sun, spaced up and down from the equator, and intermittently shut off the power beam holding them aloft. As all the satellites in that ring drop, building up speed, we switch the power for the beam back on and their plummet stops and they push back up to their original position. We do this with all the rings, in sequence, pushing much larger waves of matter toward the poles than the Thermal Driven Outflow method provides, and we call this option the Huff-n-Puff Method. And there you have it, our tips and techniques to harvest all the resources from the Solar System. To push and pull worlds, to heat them up, cool them down and use their raw materials to house humanity’s growing, ever expanding population. As we nearly achieve our Type II civilization status, and control all the energy from our Sun and all the resources of the Solar System, we set our sights on a new goal: doing the same thing for the entire Milky Way Galaxy. Perhaps in a few million years, we’ll create another guide for you, to help you make this transition as efficiently as possible. What is the Average Surface Temperature of Mercury? Of all the planets in the Solar System, Mercury is the closest to our Sun. As such, you would think it is the hottest of all the Solar planets. But strangely enough, it is not. That honor goes to Venus, which experiences an average surface temperature of 750 K (477 °C; 890 °F). Not only that, but Mercury is also cold enough in some regions to maintain water in ice form. Overall, Mercury experiences considerable variations in temperatures, ranging from the extremely hot to the extremely cold. All of this arises from the fact that Mercury has an extremely thin atmosphere, as well as the nature of its orbit. Whereas the side facing the Sun experiences temperatures hot enough to melt lead, the darkened areas are cold enough to freeze water. Mercury has the most eccentric orbit of any planet in the Solar System (0.205). Because of this, its distance from the Sun varies between 46 million km (29 million mi) at its closest (perihelion) to 70 million km (43 million mi) at its farthest (aphelion). And with an average orbital velocity of 47.362 km/s (29.429 mi/s), it takes Mercury a total 87.969 Earth days to complete a single orbit around the Sun. With an average rotational speed of 10.892 km/h (6.768 mph), Mercury also takes 58.646 days to complete a single rotation. This means that Mercury has a spin-orbit resonance of 3:2, which means that it completes three rotations on its axis for every two orbits around the Sun. This does not, however, mean that three days last the same as two years on Mercury. In fact, its high eccentricity and slow rotation mean that it takes 176 Earth days for the Sun to return to the same place in the sky (aka. a solar day), which means that one day is twice as long as a single year on Mercury. The planet also has the lowest axial tilt of any planet in the Solar System – approximately 0.027° compared to Jupiter’s 3.1°, (the second smallest). This means that there is virtually no seasonal variation in surface temperature. Another factor that affects Mercury’s surface temperatures is its extremely thin atmosphere. Mercury is essentially too hot and too small to retain anything more than a variable “exosphere”, one which is made up of hydrogen, helium, oxygen, sodium, calcium, potassium and water vapor. These trace gases have a combined atmospheric pressure of about 10-14 bar (one-quadrillionth of Earth’s atmospheric pressure). It is believed this exosphere was formed from particles captured from the Sun, volcanic outgassing and debris kicked into orbit by micrometeorite impacts. Because it lacks a viable atmosphere, Mercury has no way to retain the heat from the Sun. As a result of this and its high eccentricity, the planet experiences considerable variations in temperature between its light side and dark side. Whereas the side that faces the Sun can reach temperatures of up to 700 K (427° C; 800 °F), the side in shadow dips down to 100 K (-173° C: -279 °F). Despite its extreme highs in temperature, the existence of water ice and even organic molecules has been confirmed on Mercury’s surface, specifically in the cratered northern polar region. Since the floors of these deep craters are never exposed to direct sunlight, temperatures there remain below the planetary average. View of Mercury’s north pole. based on MESSENGER probe data, showing polar deposits of water ice. Credit: NASA/JHUAPL/Carnegie/National Astronomy and Ionosphere Center, Arecibo Observatory. These icy regions are believed to contain about 1014–1015 kg of frozen water, and may be covered by a layer of regolith that inhibits sublimation. The origin of the ice on Mercury is not yet known, but the two most likely sources are from outgassing of water from the planet’s interior or deposition by the impacts of comets. There are thought to be craters at the south pole as well, where temperatures are similarly cold enough to sustain water in ice form. Mercury is a planet of extremes. It has an extremely eccentric orbit, an extremely thin-atmosphere, and experiences extremely hot and cold surface temperatures. Little wonder then why there is no life on the planet (at least, that we know about!) But perhaps someday, human beings may live there, sheltered in the cratered regions and using the water ice to create a habitat. We have written many interesting articles about the average surface temperatures of the planets. Here’s What is the Average Surface Temperature of the Planets in our Solar System?, What is the Average Surface Temperature of Venus?, What is the Average Surface Temperature of Earth?, What is the Average Surface Temperature of Mars?, What is the Average Surface Temperature of Jupiter?, What is the Average Surface Temperature of Saturn?, What is the Average Surface Temperature of Uranus?, What is the Average Surface Temperature of Neptune?, and What is the Average Surface Temperature of Pluto? NASA – What is the Planet Mercury?